For Financial services, email marketing is designed to support customers at all levels of the customer journey. For the most part, many financial services are services that businesses and individuals are going to seek out at specific stages of life. Further, many businesses and individuals already have established financial services, and must be coaxed into shifting to new service providers. Identifying and scoring leads for email marketing is often best done through Salesforce, but Salesforce has daily email limits and other email limitations per day. Even local financial institutions will often find themselves exceeding these email limits when sending out mailers to their prospective leads. Services such as MassMailer.io can be used to get around these email limitations, letting your institution connect directly with all of your best scored leads. Provide valuable content. Financial services need to establish their authority within the industry; customers are looking for someone they can trust. In many sectors, such as the investment sectors, customers are incredibly savvy. They need content such as white papers and blog posts rather than promotional mailers. Make it easy to drop out. For your mailing lists to be effective, emails need to be distributed to customers who are truly interested. By making it easier to drop out of your newsletter, you increase your newsletter’s engagement. Avoid “spammy” phrases. Cash loans, lending now, personal loans all of these can trigger email blacklists and make it difficult for your email to get delivered. Over time it can even make your domain’s reputation go down. Always have a call-to-action. Whether it’s just following your blog for more information or actually putting in an application, the customer should know exactly what the next step is. 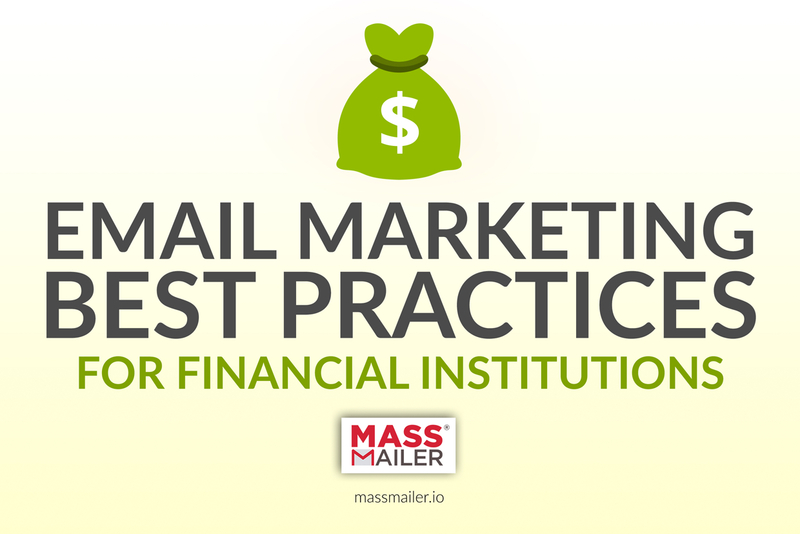 Email marketing strategies for financial institutions must often focus on identifying buyers before they are about to invest in a financial product. Auto loans, home loans, business loans; all of these generally begin with research. Thus, financial services need to use their marketing data to identify customers who are about to make purchases, such as customers who have looked up this relevant information in the past. Salesforce campaigns are able to track the contacts that customers have made to indicate the customers that are most likely to make a purchase or be interested in a specific product. By sending out email content that is valuable to them, a financial institution can support them on their journey. Residential and commercial loan companies, for instance, may want to give customers information on improving their creditworthiness or finding the perfect property. This builds up a relationship through email before the customer is ready to commit. When the customer finally is ready to engage with a financial product, they will have an already established relationship. For a successful email marketing strategy, financial services need to be able to take advantage of leads, develop relationships, and analyze their data. For all of this, MassMailer.io can help. Contact MassMailer.io today to find out more about how Salesforce campaigns can be integrated directly into an effective and comprehensive marketing platform.